STRAIN 2007 COLLECTABLE ORNAMENT – "CHRISTMAS CAROL"
Here for your consideration is a signed and numbered limited edition 2007 Collectable Christmas Ornament featuring John Paul Strain’s amazing print "CHRISTMAS CAROL" from an edition of ONLY 1000 ornaments produced. The years of 1861 and 1862 had been momentous for Thomas J. Jackson. He had gone from being an unknown VMI professor with a Major's commission, to the rank of Lieutenant General commanding the II Corps in General Robert E. Lee's Army of Northern Virginia. In battle after battle Jackson's army had defeated those who opposed them. "Stonewall" was now one of the most famous and feared generals of the war. Snow blanketed the countryside on November 22, 1862 as Confederate divisions gathered in Winchester. General Lee's communiqués to Jackson made it clear that it was time to consolidate the army, preparing for the Union Army's next move. Jackson's Corps numbered 33,000 troops, the largest he had ever commanded. The task of organizing and preparing the new II Corps was daunting, but the General was up to the challenge and kept on the move. 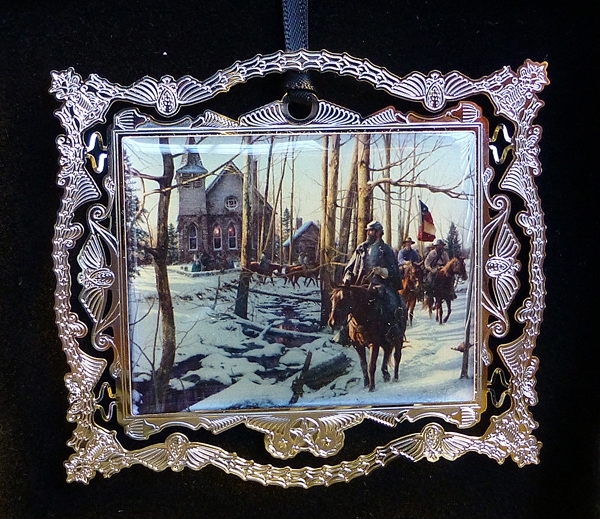 John Paul Strain’s print "CHRISTMAS CAROL" featured on the 2007 Christmas ornament depicts Stonewall Jackson and his men passing the Opequon Presbyterian Church in Kernstown, Virginia during the Winter of 1862. On an early November morning, members of the church choir practiced a favorite Christmas carol for the passing Stonewall Jackson and his men. With the fate of his army and possibly the South to be decided in the coming days, the beautiful melody of a Christmas carol in the distance uplifted General Jackson and his men as they prepared to leave for Fredericksburg. This gorgeous ornament is individually signed and numbered by the artist, is packaged in a blue box embossed with the year and the artist’s name, and comes with a descriptive Certificate of Authenticity.